In environments where there is more than one file system there are several places in the user interface where the user can select a file system. 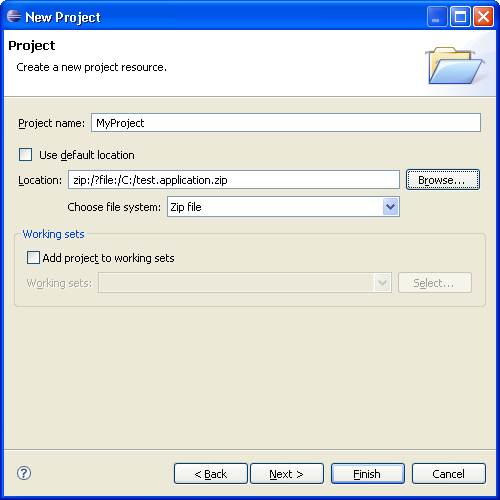 The UI support for additional file systems can be added via the org.eclipse.ui.ide.fileSystemSupport extension point. The class attribute of these schema must be a org.eclipse.ui.ide.fileSystem.FileSystemContributor which is used to supply validation and browsing of the other file systems. Above is the new Project wizard showing the extra support for multiple file systems. When more than one org.eclipse.ui.ide.fileSystem.FileSystemContributor is registered with Eclipse this selection will become available in the file, folder and simple project wizards.